How to recap this article: how to get from phosphate rock to drug fosinopril, but in two different ways? Seems a bit odd, just like discussing the merits of oil production from in the context of aspirin synthesis. Geeson and Cummins do just that in a recent Science article (DOI). They compare the utility of two phosphorous feedstock chemicals, white phosporus and phosphoric acid for organic synthesis. In established chemistry white phosphorus (P4) is obtained from phosphate rock in a thermal reaction with elemental carbon alongside carbon dioxide and calcium. This white phosphorous is then converted to hypophosphorous acid by alkali. It can then be used for example in hydrophosphination (addition along an alkene) as part of the synthesis of said fosinopril. But what if white phosphorus as a raw feedstock is not available? For this Geeson and Cummins have the answer. Phosphoric acid (H3PO4) is also obtained from phosphate rock but then by adding sulfuric acid It has benefits: lower production costs, larger industrial scale and resistant to weaponization. A thermal reaction with sodium chloride gives first sodium trimetaphosphate (Na3P3O9) and then tributylammonium bis(trichlorosilyl)phosphide (TBA)Cl3SiPSiCl3 in a reaction with trichlorosilane. 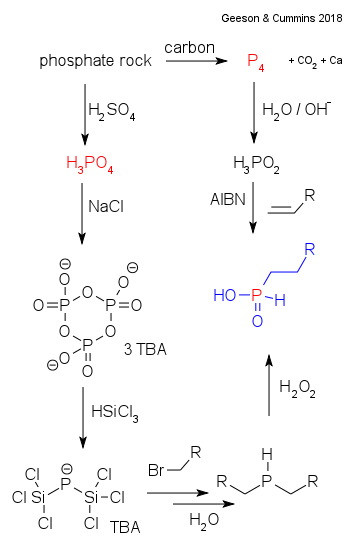 The phosphide anion in this compound is surprisingly stable and described as a "thermodynamic sink for phosphorus". And it can be used as an entry point for organophosphorus compounds as demonstrated in a reaction with an alkyl halide to the corresponding phosphine (R2PH). From then on several more steps are described to fosinopril. As a side note the research was partly funded by Moroccan Office Chérifien des Phosphates, no surprise as Morocco is the worlds largest phoshate producer.